Once you’ve selected Fountaingate Gardens as your next residence, the next (and most fun) step is selecting and customizing the perfect apartment home to fit your needs and lifestyle! With more than a dozen apartment homes to choose from, you’ll have plenty of options. 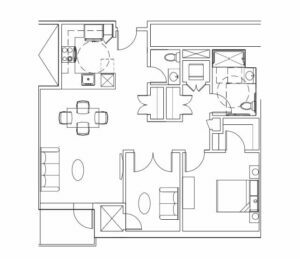 If you’re searching for a one-bedroom with spacious surroundings, the Willow will likely be just right for you. In addition to the large master bedroom, this 1,040-square-foot layout boasts open living areas, a den, spacious closets and one and one-half bathrooms. The foyer opens to a warm sunlit kitchen—a beautifully functional space. Modern appliances, richly finished cabinets and exquisite counters make your kitchen comfortable yet trendy and a great space for entertaining. The kitchen peninsula opens to the living and dining area, allowing you to remain part of the conversation while you’re hosting. An open – but still intimate – living and dining area easily accommodates your favorite furnishings and cherished decor. You can curl up in a cozy spot to enjoy a book, or entertain friends for a movie night. If you like hosting larger gatherings, pull out your favorite seasonal tablecloth and your special occasion china, and bring on the traditional holiday or family dinner. A door off the living room leads onto your private balcony. This may become your favorite space to relax in the fresh air – with wine, coffee, a book or the newspaper. You can relish quiet time here however you like and enjoy the breeze and views of the gardens, pond and trees. In any season, this is a special feature! The master bedroom has room for a queen- or king-sized bedroom set and features a large, walk-in closet. Located at the rear of the residence, the master bedroom is your sanctuary, away from the main living areas. One and one-half bathrooms provide plenty of convenience and comfort. Prepare each morning and end each day in your master bath with generous cabinet and counter space. The half bath provides the option to accommodate guests separate from your private master bathroom space. The Willow also features plenty of storage options. In addition to the walk-in closet in the master bedroom, there’s a linen closet outside the master bathroom, plus two additional closets – one in the foyer, perfect for jackets and regularly used items, and another across from the bathroom, where you could easily store holiday décor, seasonal clothing or hobby supplies. The den serves as your flex space in this apartment home, adaptable for your personal needs. Would you like a workspace for a favorite craft or hobby? You’ll have plenty of room for painting, building models, or any other passions. Do you need a dedicated office for your writing or to set up your computer? The den is a perfect place for quiet work time. Or, would you want the option to host guests overnight? Consider adding a pullout couch or day bed. The den is your space to emphasize what’s important to you. And, as always, the best part of all of the apartment homes at Fountaingate Gardens is that they’re steps away from exceptional services and amenities. To learn how you can be part of the area’s newest life plan community, and for help choosing your apartment home, call us today at (631) 210-5806.